I'd like to introduce you to the woman who helped 100,000 refugees stay warm last winter. She greeted them at a transit camp in Macedonia, where they arrived on unheated night trains and began a three-mile hike through the wilderness into Serbia. Megan helping a young girl at the transit camp. I found Megan Tucker and her grassroots movement, Winter Clothes for Refugees (WCFR), on Facebook while spending my own winter riveted to social media, looking for insight into the refugee crisis. With every news story my anxiety levels skyrocketed--children drowning at sea, long hikes into an uncertain future, hypothermia, frostbite, and European governments refusing to issue aid and safe passage. Megan's posts were among the first I found that were reassuring. She had a simple formula: raise money to buy winter clothing and supplies, then work with a team of locals to distribute them. She posted powerful stories and photos of kids who could smile because they were finally warm. 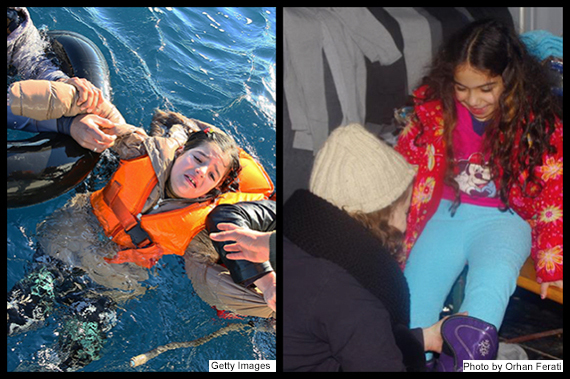 Megan gave this girl winter clothes days after she'd been rescued at sea. I had already donated to large NGOs helping refugees, but Megan made my donation feel personal. Because all money went directly to aid, I felt partially responsible for some of those smiles. Now, due to the EU-Turkey deal, no one is passing through the border where Megan and her team were stationed. She has redirected her efforts to provide aid in two nearby areas where refugees are stranded. Her team is now distributing food and vital supplies to people living in flooded tents, muddy surroundings, and sub-human conditions. With new focus and determination, she and her team have founded Charity United, under which WCFR is a movement. All donations are now tax deductible. You can donate here. I spoke with Megan about her volunteer efforts and plans for the future. How and why did you start your relief efforts? While in Macedonia on a business trip last November, I befriended some locals who lived near the refugee transit camp. They had been helping refugees there every night, and invited me to visit. I saw what graceful people the refugees were, and also how desperate their situation was. I knew that a cold Balkan winter was coming, that refugees didn't have sufficient clothing, and that they'd spend a lot of time outdoors without shelter. Many people, including children, were in danger. I started a fundraiser. Weeks turned into months. By day, I worked on fundraising and purchasing desperately needed supplies; by night, I distributed to refugees alongside my local friends. Over the next three months, we raised $100,000, and helped about 100,000 refugees who passed through our border camp. I didn't act alone--my husband, William, spent hours every day advising and assisting me with fundraising and strategy, in addition to taking over our businesses so I could spend full-time on this project. Hundreds of donors rose to the call to support us from all over the world--these were regular people: families, students, and even single mothers. I had a dedicated team of 35 local volunteers working with me on the ground. Our small fundraiser had grown into something much bigger than we'd imagined, so we founded Charity United. We intend to expand into providing more permanent solutions for refugees. Why do refugees need assistance? Why are they so unprepared for their journey? Many have lost their homes to bombings. 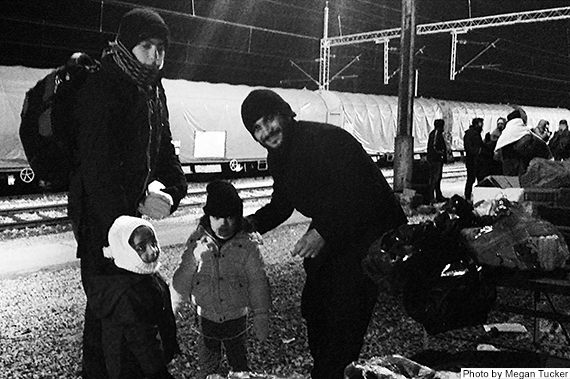 Some have spent their life savings to get their families to safety in Europe. They often lose their possessions along the route, whether because they threw bags overboard to avoid sinking in the sea, or because armed gangs, smugglers, or even bus drivers robbed them. What types of clothing were refugee children wearing when you met them? It varied. In sub-freezing temperatures, we saw extreme situations where children would arrive barefoot, in wet clothing, or in t-shirts without jackets. Other cases were less extreme but still dangerous: children missing winter gear, proper pants, or socks. They might be wearing flip-flops or sandals. The temperatures could plummet to 5° F, and they would travel on foot for several miles after meeting us. They were often ill when they arrived, from sitting in freezing water up to their waists for hours in rubber boats, sleeping for days without shelter, nearly drowning, and more. I met one girl who was wearing leggings, thin as tights. That night the temperature was 14° F. I gave her two layers of pants, socks, and snow boots. Later, I saw photos (above) of this same girl being rescued from an overturned boat in the freezing sea, which had happened just days before I met her. She was in no condition to travel in subfreezing temperatures at all, let alone with insufficient clothing. What percentage of the refugees you helped were children? My personal estimate is 25%-30%. Did you meet any single men who were refugees? What were they like? Not all families in war-torn nations have the funds for the entire family to attempt the trip to Europe. Some send the oldest son in hopes that at least one member of the family will survive. I met many single men. Overall they were intensely polite, and treated me extremely respectfully as a woman. When it was cold, they'd offer me the blanket I'd just given them. They would often volunteer to help us by translating, or distributing clothing. One Syrian man asked what I was doing there, and I explained that that I'd come from America to help refugees. His eyes welled up with tears. He looked shocked, and began saying "thank you" over and over. I told him that many Westerners had donated money for the clothing we were handing out. His eyes teared up even more. He told me that American people are good, that people everywhere are good--that it's the politicians who are the problem. He asked if he could help distribute, and when I said yes, it was the happiest I had seen him all evening. His enthusiasm was radiant, and every time I pointed to a child who needed something, he ran off eagerly to help. A young Syrian man who received aid was thrilled to help with distribution for a while. It is up to people like you and me to provide aid, pressure our governments to end the wars, and support refugee relocation programs. It also helps tremendously when you share our stories on social media and in personal conversations. Learn more about WCFR, Charity United, and how to make a donation.